Employees of Bauer Media Group (LP) NZ, their affiliates, agencies and immediate families are ineligible to enter. No responsibility is taken for lost, misdirected or incomplete entries. Entries are limited to one per person. Open to New Zealand residents only. This promotion commences February 3, 2019 and ends February 17, 2019. By registering their details, entrants give permission for Bauer Media Group (LP) NZ to post, email and mobile text message updates. 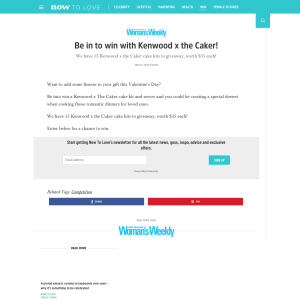 The prize consists of a Kenwood x the Caker cake mix. We have 15 to give away.